Dell XPS M1210 is a rugged and lightweight ultra-portable notebook computer. Dell XPS M1210 features Intel Core 2 Duo dual core processor, 12.1-inch Dell TruLife LCD flat panel, optional built-in 1.3 megapixel camera, optional integrated omnidirectional microphone, optional an integrated mobile broadband antenna, optional integrated Mobile Broadband card that enable wireless access connection with cellular service, HyperConnect Wi-Fi, Dell MediaDirect when laptop is off, free 15-months XPS VIP subscription and optional 256MB NVIDIA GeForce Go 7400 TurboCache16 graphic card. 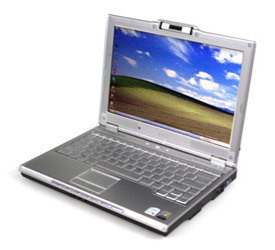 Dell XPS M1210 weighs about 4 pounds, and runs Microsoft Windows XP, and is Windows Vista capable. PC Magazine gives very good editors’ rating of 4 out of 5 and concludes that Dell’s latest XPS is a notebook for anyone who has a specific yearning for power, connectivity, and ultra-lightweight portability. The notebook is good for ultralight for flights, built-in EV-DO, discrete graphics, superior horsepower and vivid display. But it runs hot. NotebookReview reviews Dell XPS M1210 with 1.66GHz Core Duo Processor and concludes that this is the best ultraportable notebook to date hands down! Its small, very fast, and lightweight. It can play games. Keyboard and mouse rock. Battery life of 6hrs+, good HD choices size/speed in build process. Fast DDR2 memory. However, M1210 lacks of good software pre-installed with the system, expensive, blue lights on front that may drains battery life and it’s been really hard to find anything bad to say about this notebook.